Open "Remote Desktop Connection" , go to "Local Resources" tab . 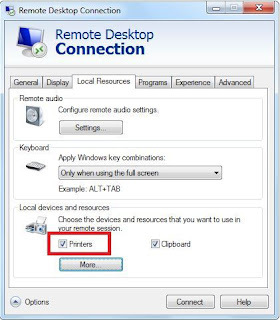 To use your local drives (c:, d: , e: etc) click "More..." button, click +Drives to show the drives list , and select drives to use in remote session and press "OK", then go to General tab , enter the IP address or hostname of the remote pc you want to connect and press "Connect ". Now local devices are available in the remote session. 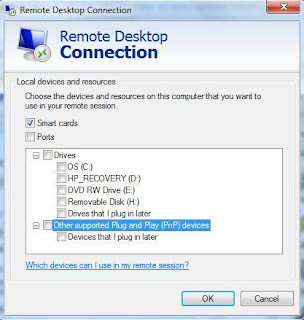 How to disable local printers, drives and other resources in remote desktop sessions? To disable local drives (c:, d: , e: etc) click "More..." button, click +Drives to show the drives list , and uncheck drives you don't want to use in remote session and press "OK", then go to General tab , enter the IP address or hostname of the remote pc you want to connect and press "Connect ". Related:Event ID: 1111:Driver Microsoft XPS Document Writer required for printer Microsoft XPS Document Writer is unknown. Contact the administrator to install the driver before you log in again.